We climbed the lookout tower and scanned Raymond Pool. We had about 20 American Avocets and a few Black-necked Stilts along with the expected Greater and Lesser Yellowlegs, Dunlin and Short-billed Dowitchers. We continued the drive and by-passed the Boardwalk Trail as it was undergoing repairs. Shearness Pool was quiet and only a few Great Blue Herons, Snowy Egrets and Great Egrets seen. 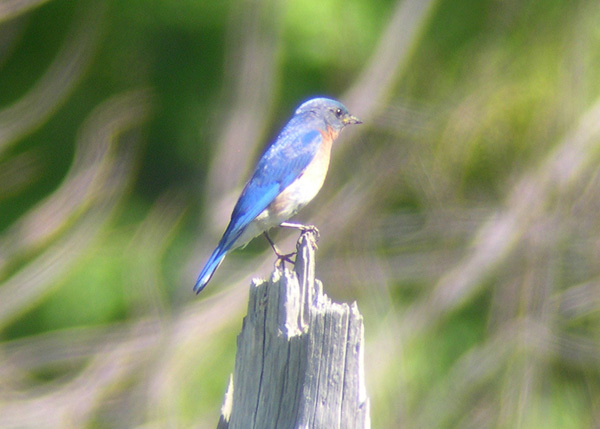 We had some great look at Willets next to Bear Swamp pool and an Eastern Bluebird was seen on the way out. The drive to Cambridge, MD took us through many farms, some just plowing their fields. At one farm there was a tornado of Laughing Gulls circling a plow chopping and stirring up morsels of worms and other food for the gulls. We stayed at the Days Inn in Cambridge and after dinner and breakfast at a local Denny’s we headed out early for Blackwater NWR. We decided to try a new trail we heard about called the Tubman Road Trail on Hip Roof Road off of State Road 335 three miles south of the refuge. On the dirt road leading to the parking area we had singing Prairie Warblers and Field Sparrows. A pair of Blue Grosbeaks few across us and perched in a small pine for us to observe and photograph. There’s a small platform overlooking a marsh and we were amazed at the diversity we found. 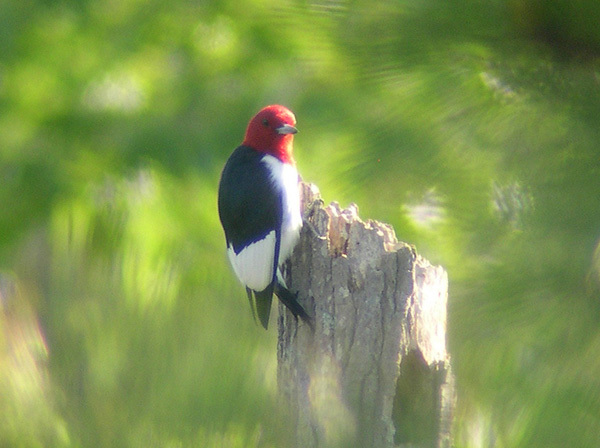 Four Red-headed Woodpeckers, courted, bickered and chased each other as we also found a Summer Tanager, Orchard Orioles and a first of the season Baltimore Oriole. We found a Bald Eagle nest in a pine tree with a lone young eaglet and an adult perched nearby keeping watch. The two mile trail took us through swamp and forest. Some butterflies were out. Red-bellied turtles were basking in the sun. The pools of water lining the trail had tons of frogs at their edges. The little ones would spring into the air and plop into the water while squeaking. It was comical – as we moved along all we would hear is dozens and dozens of squeak, plop, squirt, plop, eurp, plop! 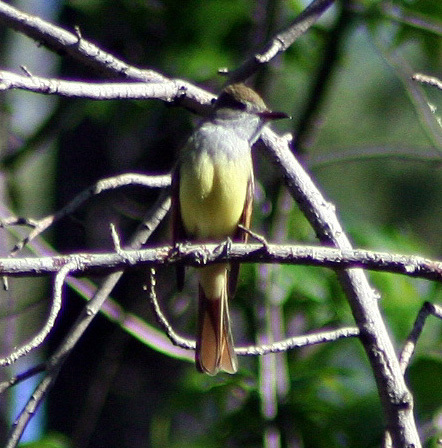 We did see birds, Great Crested Flycatchers, Blue-gray Gnatcatchers, secretive White-eyed Vireos and Carolina Chickadees. We headed for the visitor center with obligatory shopping in the gift shop. The garden in back of the center had Barn Swallows busy building their mud nests, Ruby-throated Hummingbirds battling over the one feeder and an American Robin trying to feed her young with dozen people roaming right nest to her nest. 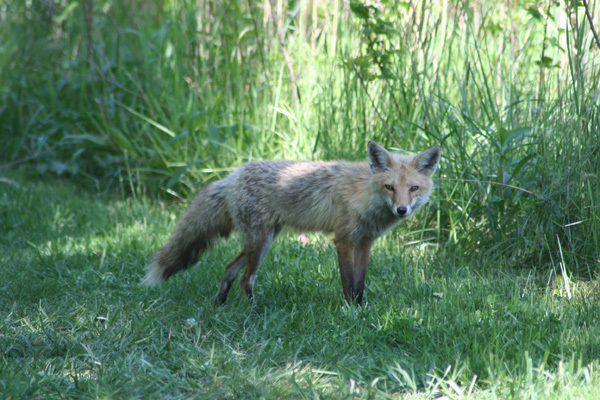 We hit their wildlife drive but it was relatively quiet. Still we had Bald Eagles, Osprey, and a far off Eastern Meadowlark. It was time to eat so we completed the trifecta, Denny’s for lunch! The afternoon was spent heading to Chincoteague, VA. The causeway/bridge now drops you off right at Maddox Blvd instead of Main Street. This makes it much easier to get to the wildlife refuge. Once we arrived it was straight to the gift shops –The Brant- our favorite on the island. We quickly headed to the wildlife drive and found lots of Glossy Ibis, Great and Snowy Egrets. 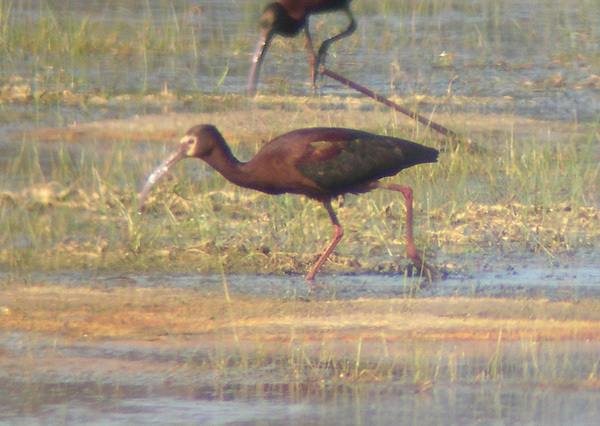 Near the end we had the birds of the trip, two White-faced Ibis, bird from the south west! 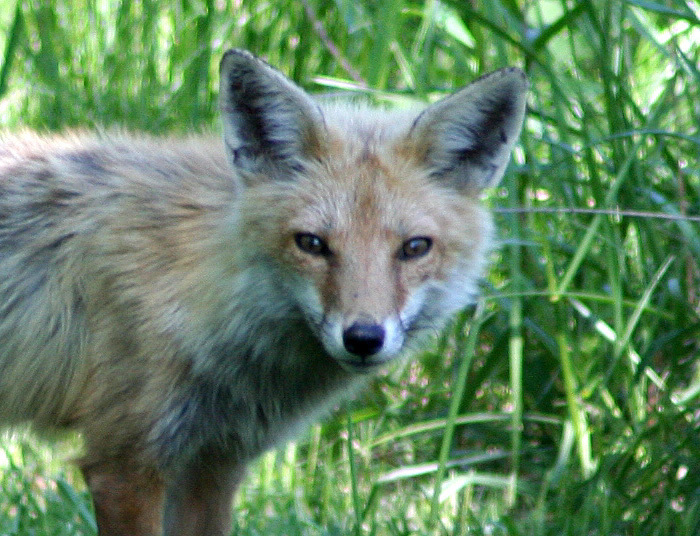 Their diagnostic red-eyes and complete white facial markings were easily seen. We later found an alien looking Mole Cricket on the path. Dinner was at Bills, a new restaurant for us, my oysters and crab cakes were great but Kelli’s grilled chicken was a big disappointment. It’s hard to find a good restaurant for those who are not into seafood on the Island. We woke up early Saturday and after a good free breakfast at the Best Western (formerly the locally owned Driftwood Motor Lodge) we took a stroll and heard many Clapper Rails in the marsh. A drive out to the beach was quiet but we did find both Tri-colored and Little Blue Herons. The only Chincoteague Ponies were penned up. It seems that they don’t let the ponies run as free as they used to. This will take a huge chunk of the charm out of this refuge. We may be seeing the beginning of the end of this unique spot. It started years ago with a McDonalds on the main island, and recently the influx of chain motels. Many of the great locally owned restaurants are gone or changed hands such as the once great Pony Pines Restaurant. This may just end up being just another beach attraction and nothing more. Hopefully I’m wrong. They were working on the beach, trying to replenish the sand that was taken by mother nature during the winter. It smelled horrible. We stopped at the Woodland Trail and scored a look at a Brown-headed Nuthatch in the parking lot. We tried the trail but the mosquitoes were out in force. We still had time before the visitor center opened so we hiked the Marsh Trail. 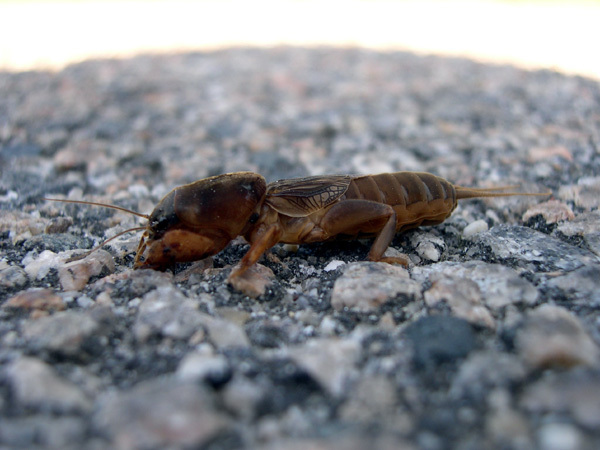 Another Blue Grosbeak greeted us and we came across one of nature’s odder creatures, a huge Mole Cricket scurrying across the pavement. It reminds be of the monster in the Cloverfield movie, but in this case relatively harmless. We headed north to Milburn landing in Maryland. 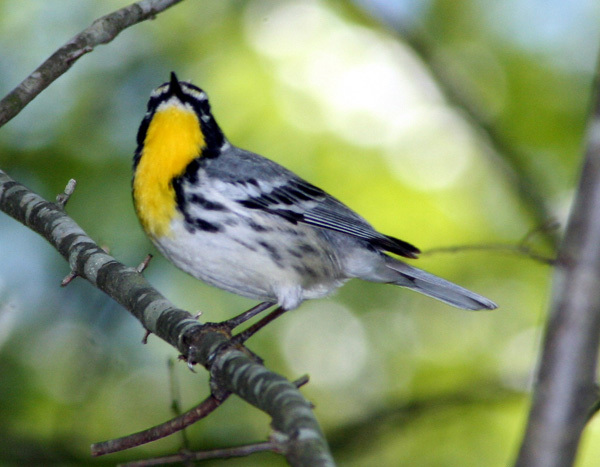 A Yellow-throated Warbler was singing in the parking lot. We later spished him in and had great looks and a great photo opt. Kelli then notices an odd sparrow with a white head on the ground in front of us. It turned out to be a partial albino Chipping Sparrow, its mate, a normal looking Chipping was nearby. 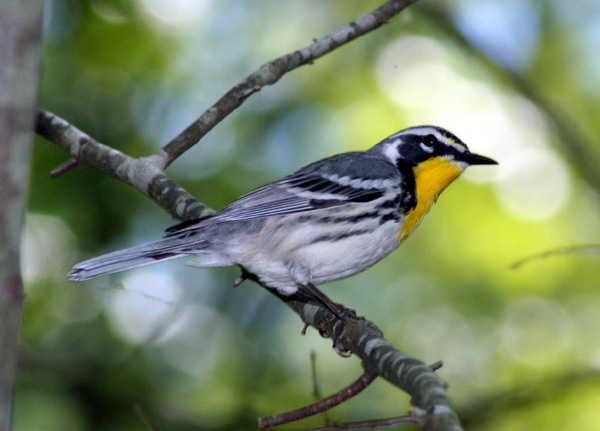 We took the tail into the swamp and had our final southern specialty of the trip – a Prothonotary Warbler.